UTULEI, AMERICAN SAMOA (20 October 2017) The Western Pacific Regional Fishery Management Council today at the Rex Lee Auditorium in Utulei, American Samoa, took initial action on a new proposed amendment to the American Samoa Large Vessel Prohibited Area (LVPA). The new proposal addresses a 2017 decision by the Federal District Court for the District of Hawai‘i regarding an LVPA amendment recommended by the Council in 2015 and published as a final rule in 2016 by the National Marine Fisheries Service (NMFS). The court held that the 2016 final rule failed to consider the American Samoa Instruments of Cession as “other applicable law” and that cultural fishing rights are protected by inference in the Instruments. The LVPA extends from 0 to 50 nautical miles (nm) from shore within the American Samoa archipelago and prohibits all commercial fishing vessels 50 feet in length or larger from catching pelagic fish within it. The LVPA was created in 2002 by the Council to support a fleet of approximately 40 alia longline vessels. Alia are aluminum, double-hulled vessels generally around 30 feet in length. By 2015, that fleet had declined to a single active vessel. The local fleet of mono-hulled longline vessels over 50 feet in length faced a variety of challenges. Among them were declining catches attributed to increased competition by subsidized foreign fisheries targeting albacore and reductions in net revenue. The preliminary preferred alternative for the new amendment would allow vessels 50 feet in length or larger permitted under the American Samoa longline limited entry program to operate outside 12 nautical miles (nm) around Swains, Tutuila and Manu‘a Islands. It would prohibit them from operating within 2-nm of offshore banks. During a public hearing on the LVPA issue held Oct. 17, 2017, at the Rex Lee Auditorium, the banks were identified as important to troll and bottomfish fishermen. Council Member Henry Sesepasara, director of the American Samoa Department of Marine and Wildlife Resources, cast the sole vote against the action today. 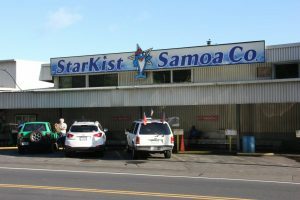 Council Member Taotasi Archie Soliai, manager of human resources and government affairs for the local StarKist cannery, said continuous supply of albacore is important to the facility. “This year and last year we had to shut down several weeks because of fish supply,” he said. “It is very important that uninterrupted supply be sustained. Any interruption that affects supply results in plant closures, which in turn hurts our employees.” He thanked the Council for considering the amendment to help the boats that supply fish to StarKist. Council Member Christinna Lutu-Sanchez, an owner of local longline vessels, said the outcome of the action is not a guaranteed solution to the economic situation, but the Council has to try to continue to help the fishermen and reduce the US seafood trade deficit. In making its decision today, the Council recognized the importance of fishing to the American Samoa economy, culture and food security and its support of all forms of fishing associated with the Territory. The Council will consider a range of options and may take final action on the new LVPA amendment at its March 2018 meeting in Honolulu. The Council today also recommended that NMFS, by Jan. 30, 2018, gather information on the issue of cultural fishing in American Samoa, which may include expert interviews and focus groups as well as document fish flow from small and large vessels. The Council also took final action to modify the American Samoa longline limited entry permit program. The aim of the modification is to eliminate regulatory burdens that may prevent vessels from entering into the fishery. Council Members Soliai and Lutu-Sanchez recused themselves from the vote. Pelagic Fishery Ecosystem Plan, Amendment 7 Specification Process: The Council will inform Secretary of Commerce Wilbur Ross that NMFS for the past three consecutive years has failed to authorize the US Territory longline bigeye limit specifications prior to the US longline bigeye limit being reached. The resultant shutdowns of Hawaii longline vessels have impacted vessel owners, crew and local seafood markets. The Council will ask that NMFS develop a procedure with clear deadlines in order to prevent future unnecessary delays and impacts. Kitty Simonds, the Council’s executive director, said a 40-day closure this year goes against efforts by Secretary Ross to reduce the US seafood trade deficit. “We need to do a better job so there are no closures,” she said. Council Member Dean Sensui said, “Delays like this cost longline boat owners thousands of dollars a week and trickles down to others.” He noted that the closures also increase health risks to consumers because they result in more seafood imports. US Longline Bigeye Limit in the Western and Central Pacific Ocean: The Council recognized that the Western and Central Pacific Ocean (WCPO) bigeye tuna is not subject to overfishing or considered overfished. It will ask the US government to work to obtain a US longline bigeye limit of 6,000 mt under the Western and Central Pacific Fisheries Commission (WCPFC) tropical tuna measure and to acknowledge that any proposed reductions in the US longline bigeye limit would prevent the US in joining consensus on a new tropical tuna. The current US quota for longline-caught bigeye tuna in the WCPO is 3,345 mt. “Our quota is pathetic,” Simonds said, noting China and Japan have two to five times as much. “The United States needs to stand up for its fisheries,” she added. Annual Limits on Sea Turtle Interactions in the Hawaii Shallow-set Longline Fishery: The Council recommended removal of the hard cap measure consisting of annual limits for loggerhead and leatherback turtles and associated fishery closure procedure as a preliminary preferred alternative. The gear measures implemented in 2004 have successfully reduced sea turtle interactions in the fishery. The hard cap measure is no longer necessary given that the fishery and turtle interactions are likely to remain relatively stable in the future and unlikely to rebound to the 1990s peak levels. The removal of the hard cap measure would reduce uncertainty in the fishery and eliminate the potential for spillover and transferred effects of increased overall impacts to sea turtles in the Pacific.